Being a marketer in financial services has become an increasingly challenging profession. Beyond having a creative mind and analytical skills, today’s marketer has to remain on top of constantly changing trends in marketing technology, data regulations, channel use and consumer behavior. To succeed, bank and credit union marketers must understand how to collect insights and deploy communication, in real time, in a manner that will stimulate consumer engagement, trust and loyalty. Now more than ever, financial marketers must be agile and be able to quickly adapt to change. This includes finding new sources of data, experimenting with artificial intelligence (AI), using new marketing technology platforms and connecting with consumers on their own terms with personalized experiences. The key is to start small, testing several alternative strategies, and then scaling out a cohesive array of communications — across multiple channels, connecting with consumers in context, no matter where they are. We are in a marketing era where advertising giants can be outdone by much smaller firms who understand the power of contextual engagement. A great example is how Tesla outmaneuvered Mercedes Benz by having conversations about the benefits of electric vehicles as opposed to just selling cars. They were able to drive sales without the need for advertising. 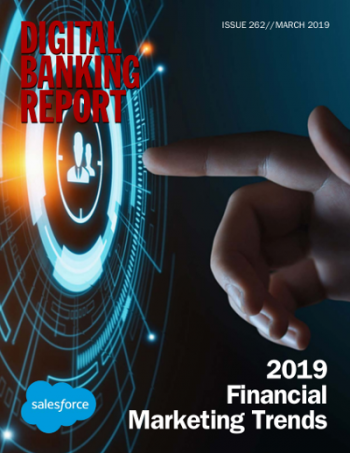 The 2019 State of Financial Marketing research found that financial marketers need solutions that can support the proliferation of traditional and new engagement channels, including chat, video, co-browsing, messaging (such as SMS, Facebook Messenger or WeChat). This amounts to supporting a consumer’s journey across different channels, providing proactive insights and advice in real time. The future of financial marketing must move beyond mass media and branch-based communication, learning from surrounding stimuli and making more informed decisions than ever before. Successful marketers will need to learn how to blend data, analytics and marketing technology internally and with preferred partners. In this seventh year of measuring financial marketing trends, we see an increased focus on new customer acquisition and a surprising drop in the emphasis on cross-selling and retention. By comparing results of this year’s survey with those of previous years, we continue to see a high awareness of what must be achieved along with a lack of confidence in being able to do what is needed..
We would like to thank Salesforce who sponsored this year’s survey development and is making this report available to the marketplace at no charge ($695 value). Their partnership enabled us to continue to do the most comprehensive marketing trend analysis in the banking industry. This year’s report provides a perspective of where financial services marketing is today and where it may be tomorrow. More importantly, this report provides the foundation for financial marketers to embrace change, take risks and disrupt themselves.